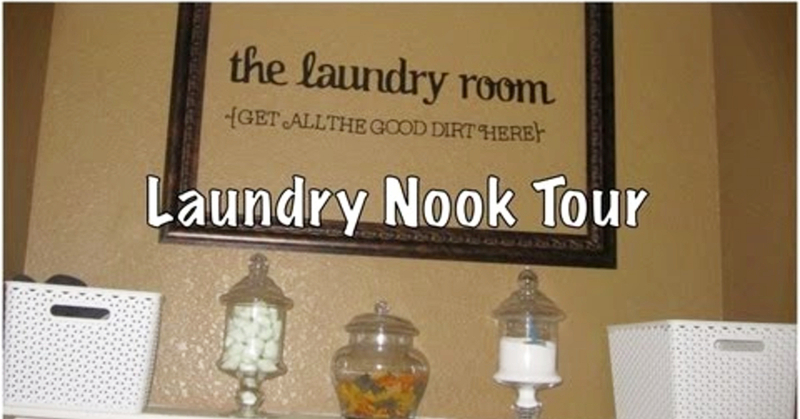 Clever, creative and unique ideas for a small laundry nook in any area of your home. 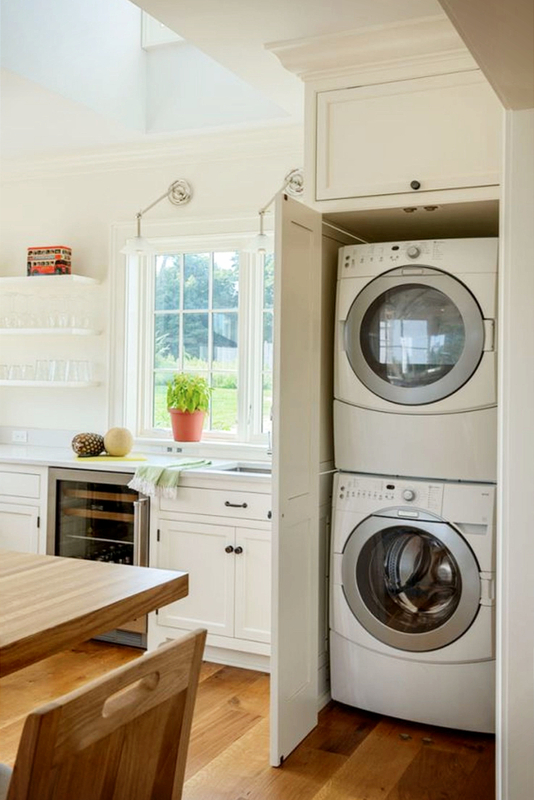 From converting an area of your garage into a laundry nook, to having a laundry nook in your basement, kitchen, bedroom, or bathroom – there are lots of ways to fit a laundry nook into your home. 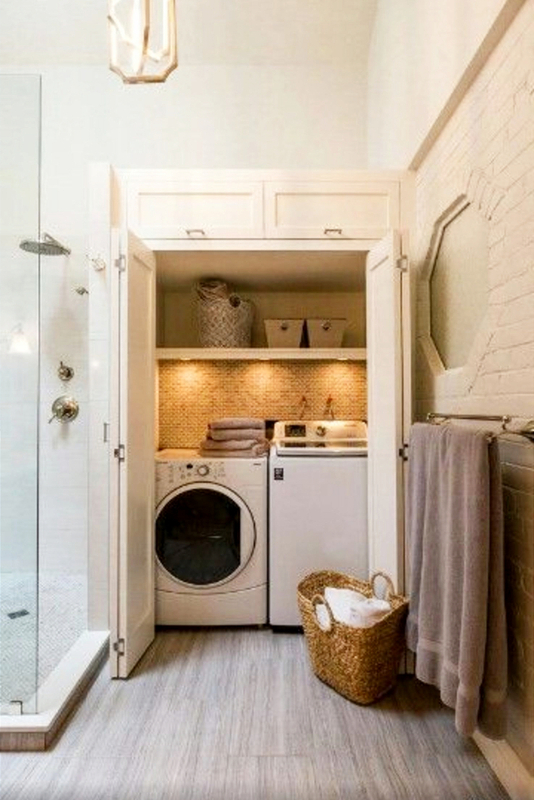 Let’s jump in and take a look at some laundry nook inspiration. As always, feel free to pin any and all ideas you like to Pinterest. 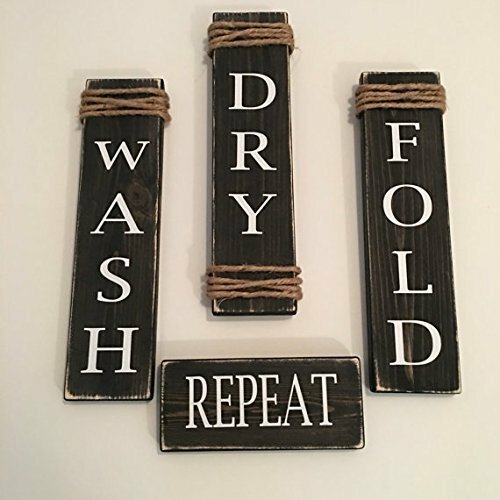 Let’s take a look at some laundry nook inspiration for creating your own laundry nook in your garage, basement, kitchen, bathroom, bedroom or converting a small closet into a laundry nook. 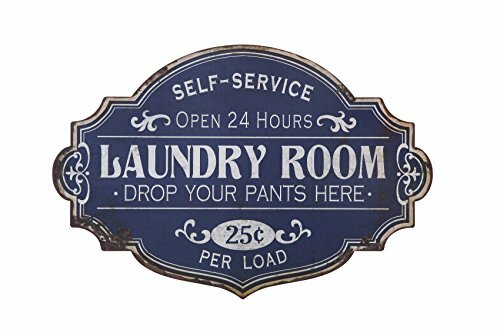 If you’re looking to create a laundry nook area in your basement, here are some ideas to consider. 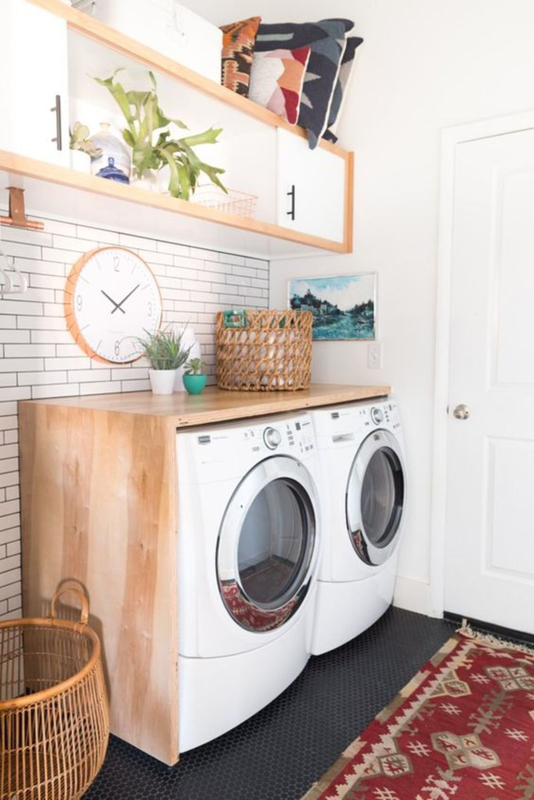 You can get really creative with DIY ideas in your basement area and actually convert a drab basement corner into a beautiful and functional laundry nook. 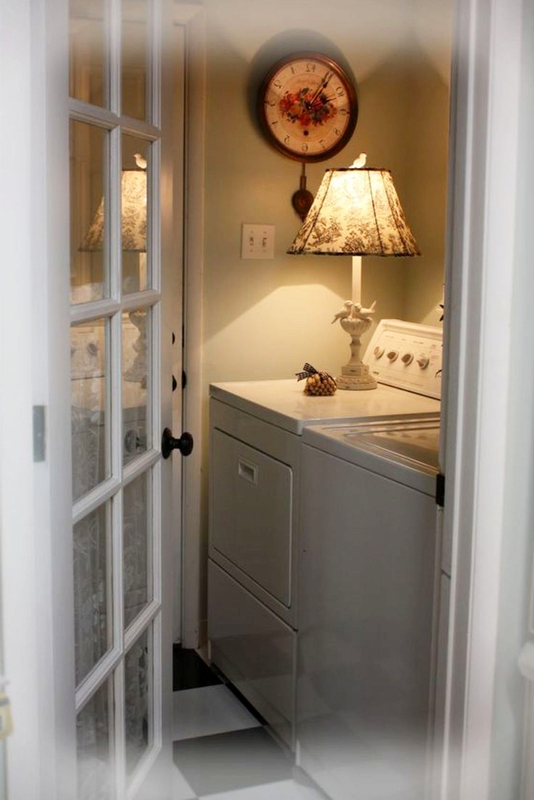 I love the idea of using curtains to hide your washer and dryer in a laundry nook that is in a room. 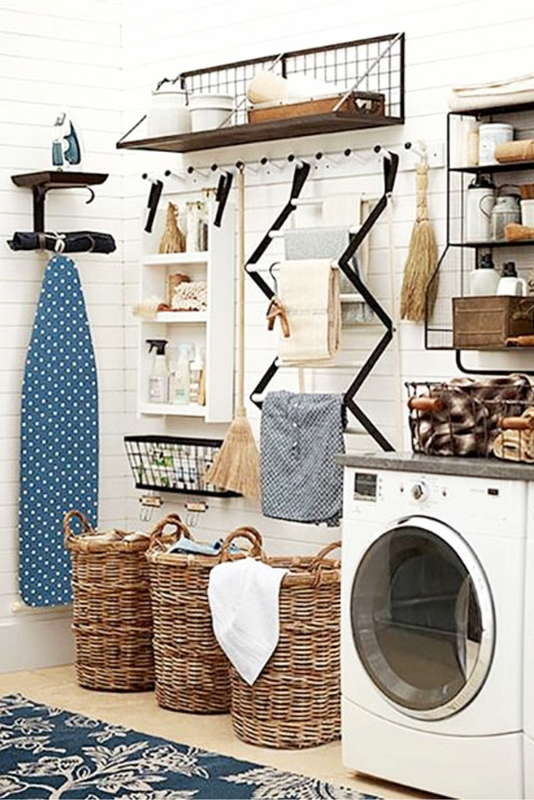 Baskets and shelves can help keep your laundry nook organized and clutter-free. 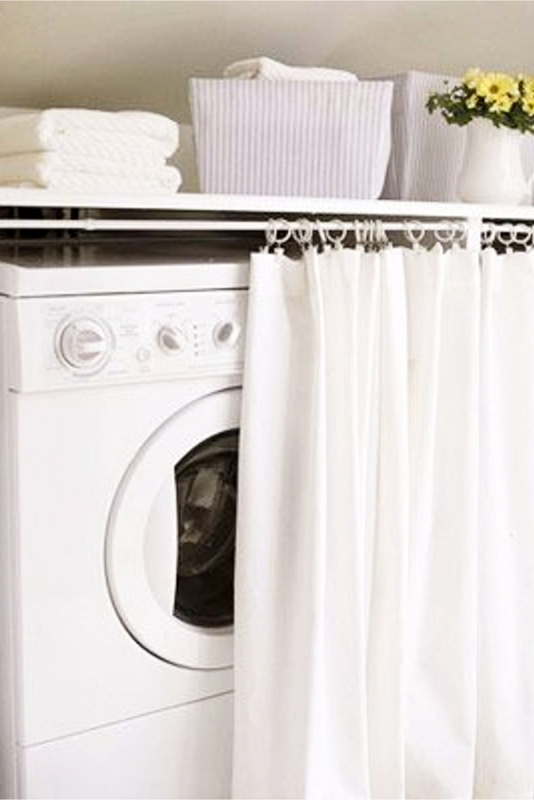 Here are some very creative ways to have a laundry nook in your bathroom. 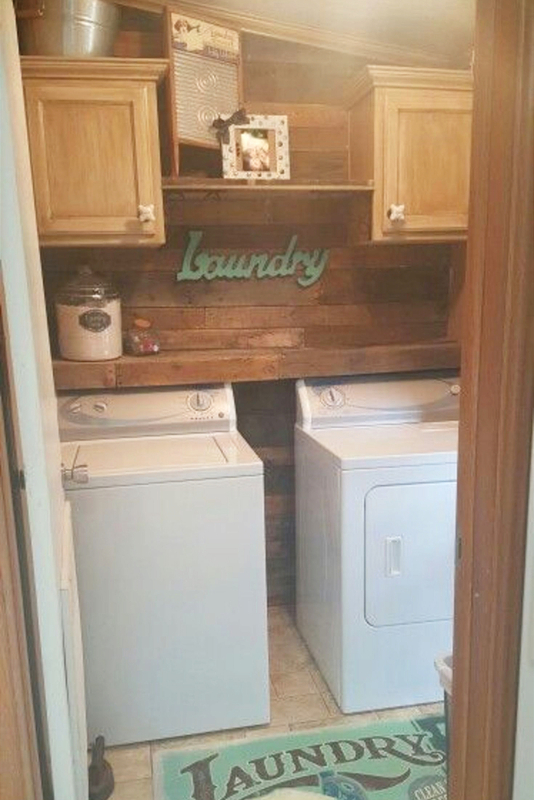 Some of these hidden laundry nooks are very creative! Having a laundry nook in your bedroom might be a necessity based on space availability (for example, in an apartment, condo, or small home). The curtains idea is a smart way to hide and conceal the washer and dryer in your bedroom. 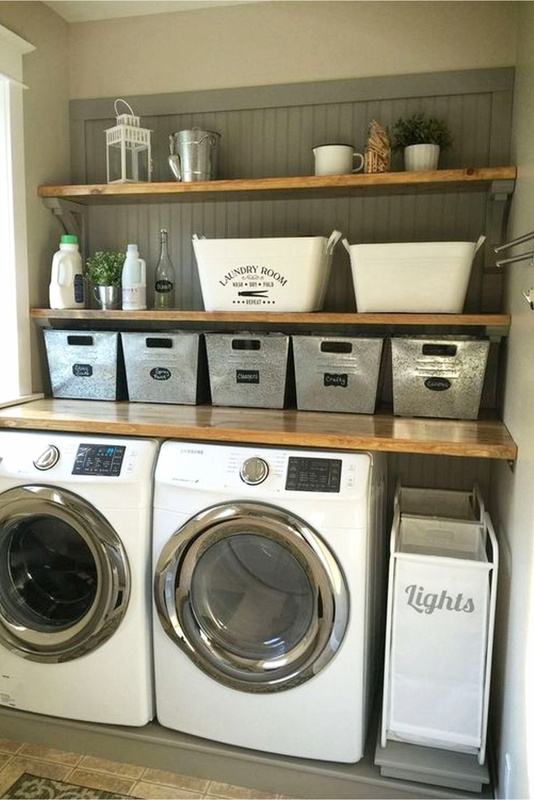 Again, shelves, baskets, etc go a long way to giving you more room in your laundry nook. 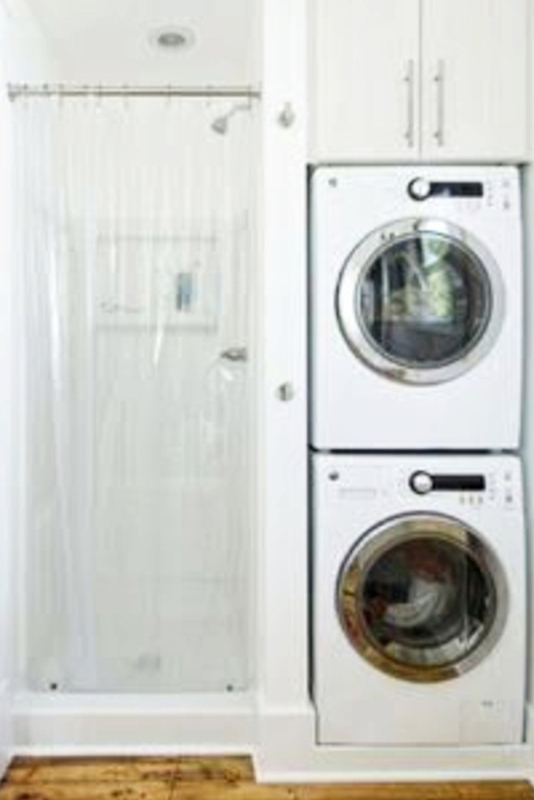 Converting a closet into a laundry nook is a fun and pretty easy DIY project. 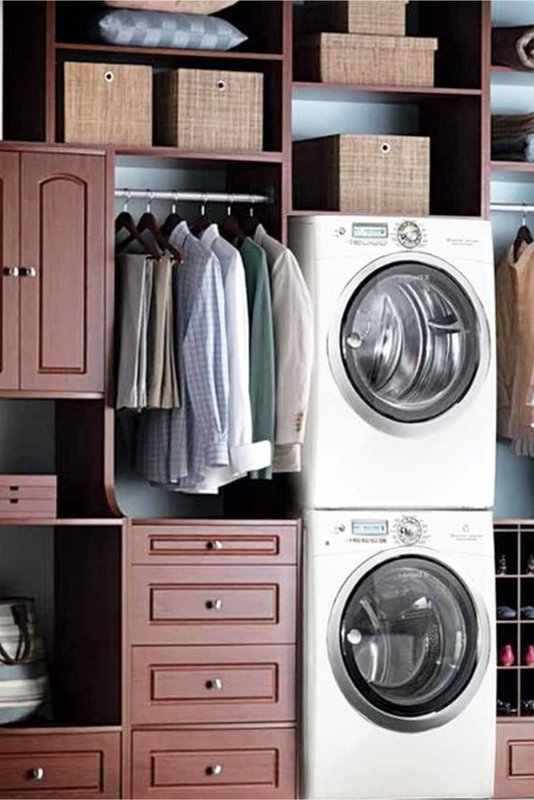 Naturally, stacking your washer and dryer will give you more room (or enable you to use a smaller closet). 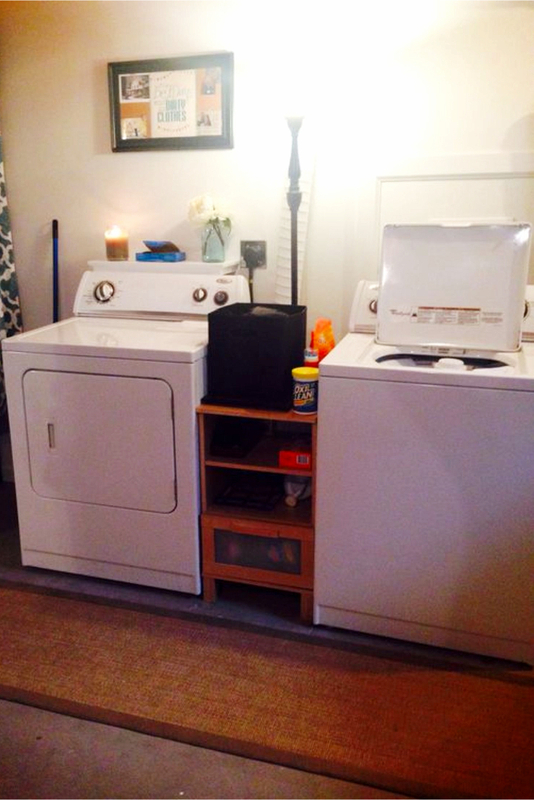 You don’t have to buy a stackable washer/dryer unit either. 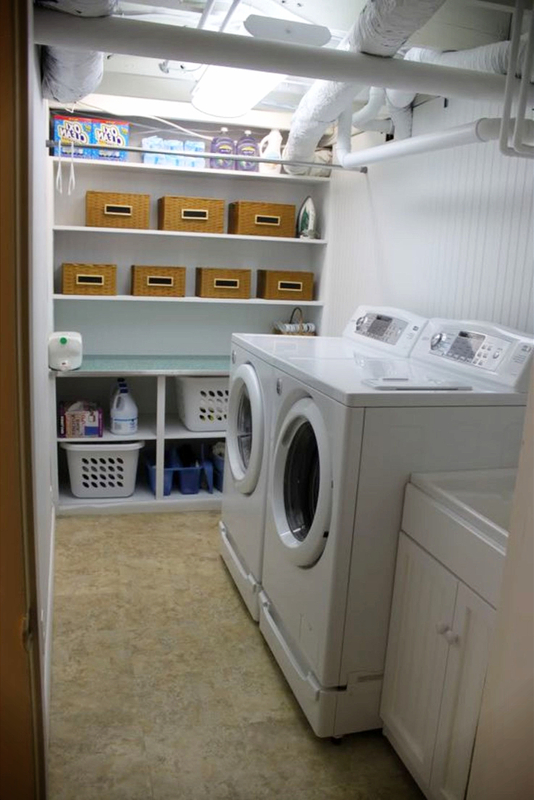 As you can see in one of the laundry nook closet pictures below, you can stack full-size washers and dryers. 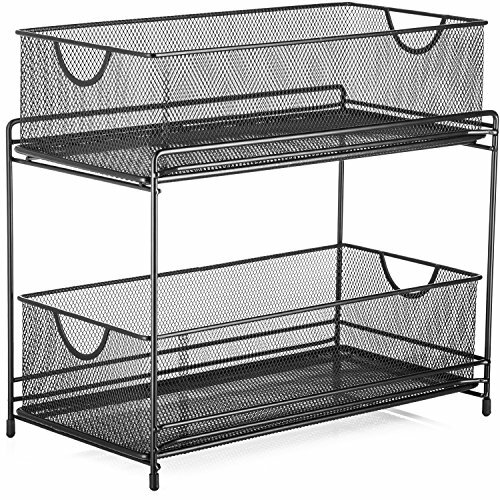 Those stackable basket shelves sure would be handy! 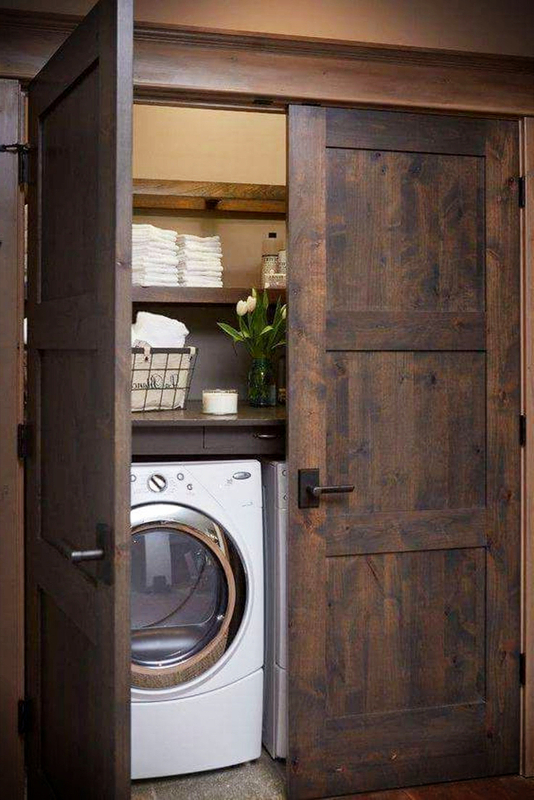 What a smart idea for more room in a laundry nook! 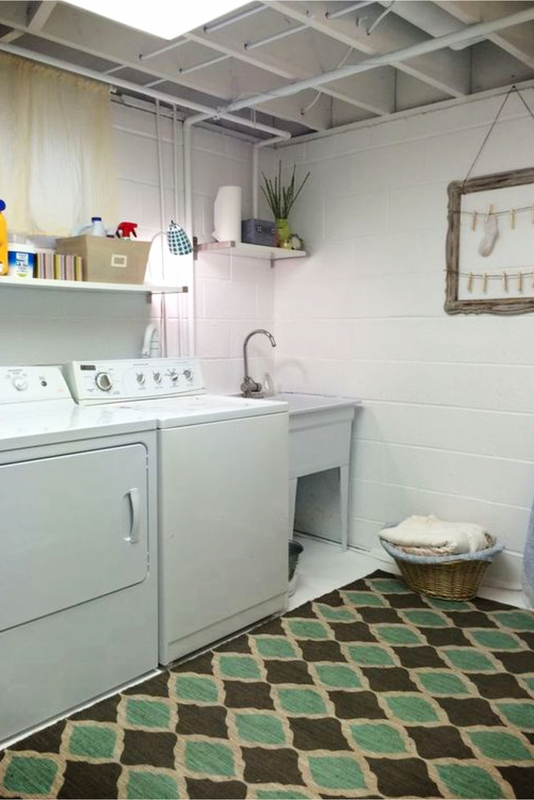 Looking to convert part of your garage into a laundry room nook? 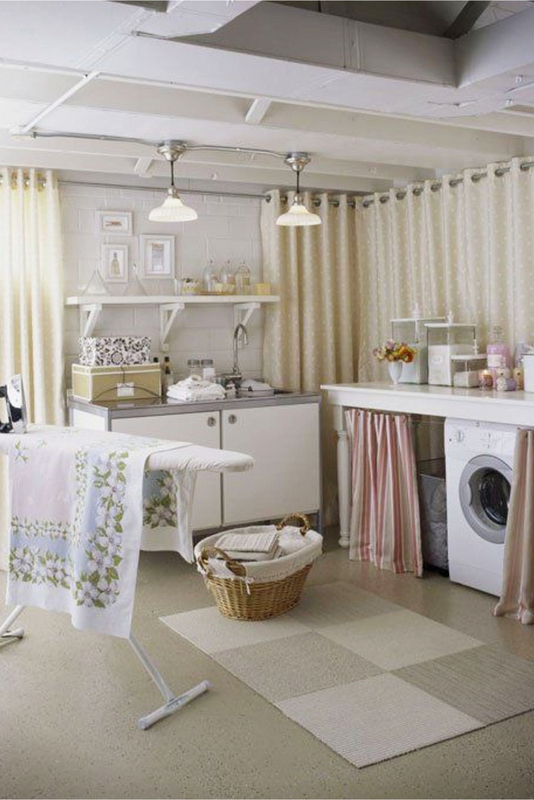 Here are some great ideas for a laundry nook in a garage. 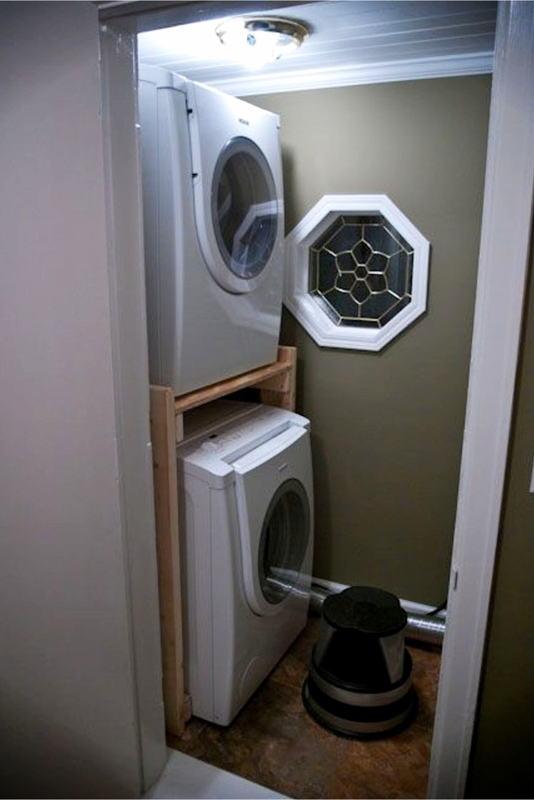 As you can see, homeowners get pretty clever and creative with their storage ideas in their garage laundry nooks! 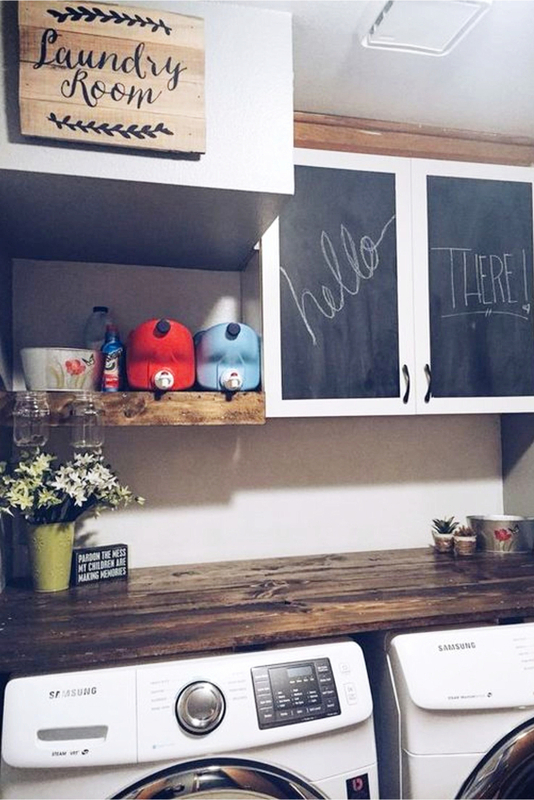 LOVE the chalkboard cabinets in the next laundry nook idea! 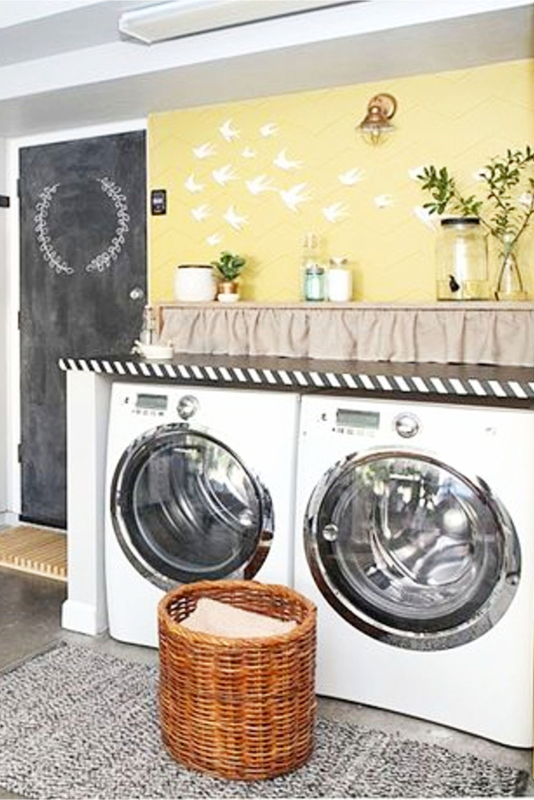 Creating a laundry nook in your kitchen can be a simply DIY project – and it can be a very involved project. 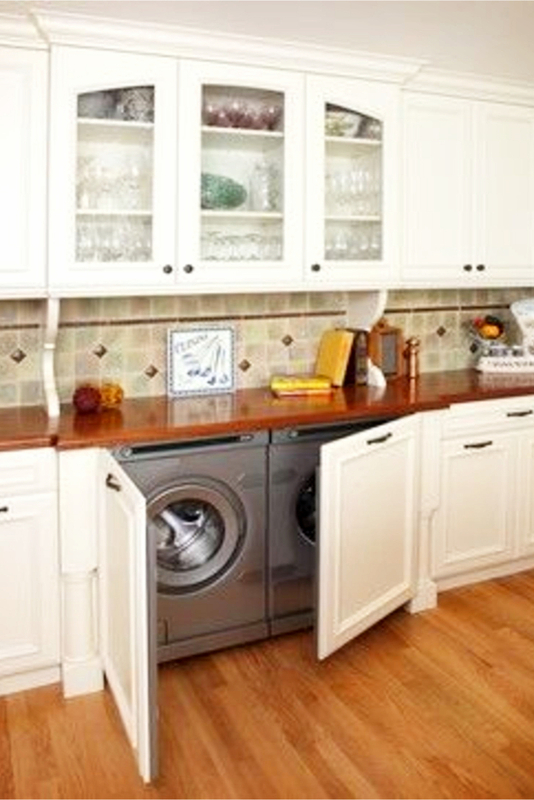 I love the idea of concealing the washer and dryer under the kitchen counter with cabinet doors – that’s just brilliant! 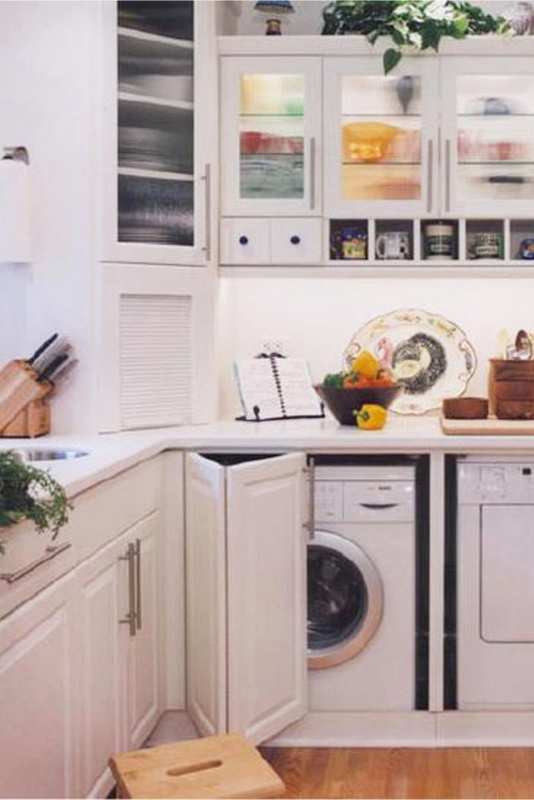 If you have a small closet or wall area in your kitchen, with a little creativity, you can easily turn that area into a laundry nook in your kitchen. 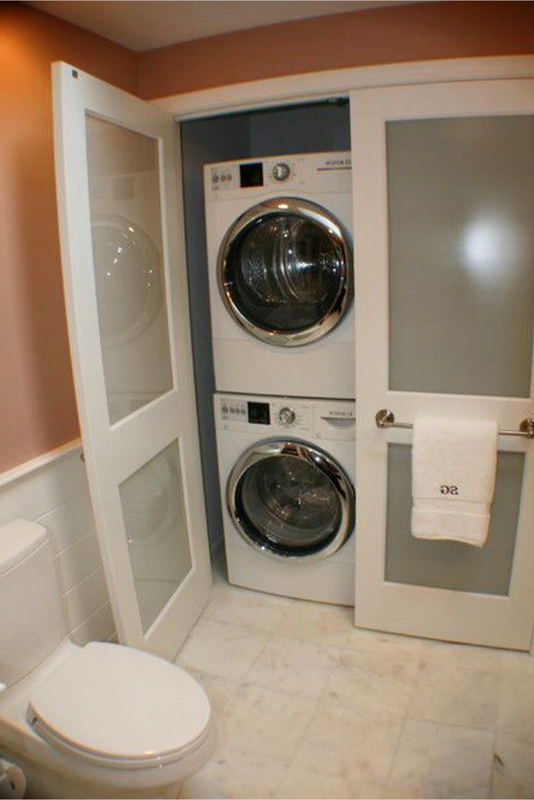 Today when space is at a premium, the area available for your laundry nook may be very limited. 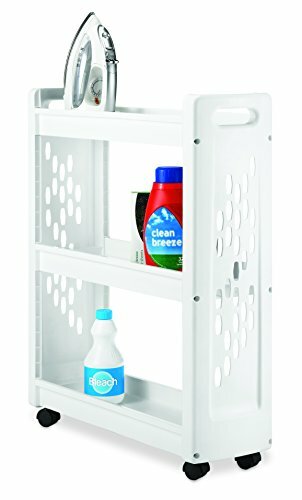 By using clever space saving techniques and multi-purpose utility products you can organize your laundry nook to look clutter-free and impressive. Getting wall-cabinets to efficiently use the space available is a clever idea since it will not take up any of your floor space. You can store all of your cleaning material like soap, bleach, softener and stain removers in it and they’ll be within easy reach, yet conveniently out of the way. 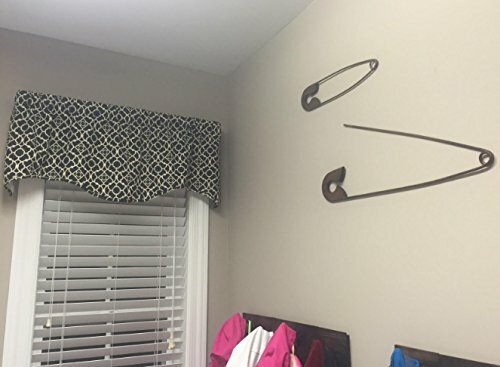 Putting up a few hooks in or below the cabinets will help create more space for storing things that can be hung. This way they will not take up shelf space. If you think wall cabinets are too expensive, wall shelves are also an attractive, yet affordable, alternative. Use boxes to keep your shelves organized and clean. Remember to clear away empty bottles and products that have gone unused and have been sitting on the shelves too long. 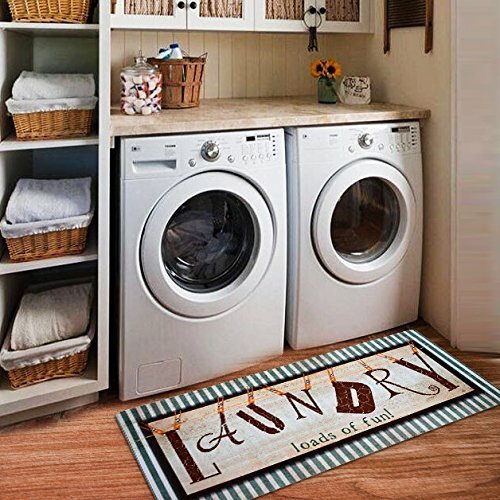 That way you free up more space and reduce the clutter in your laundry nook area. It is also a good idea to organize your dirty clothes by using a laundry sorter, that way your clothes will already be in their proper place when you need to do them. 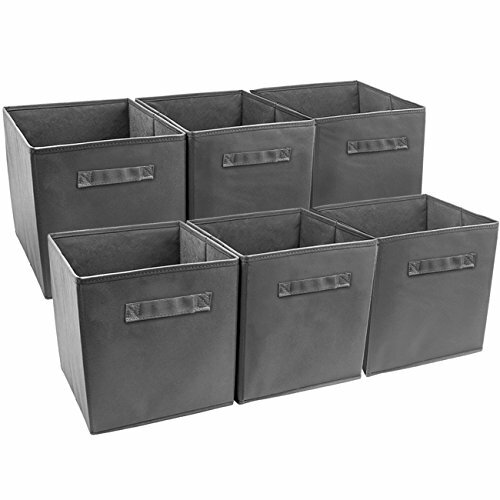 You won’t have to waste extra time sorting them yourself. 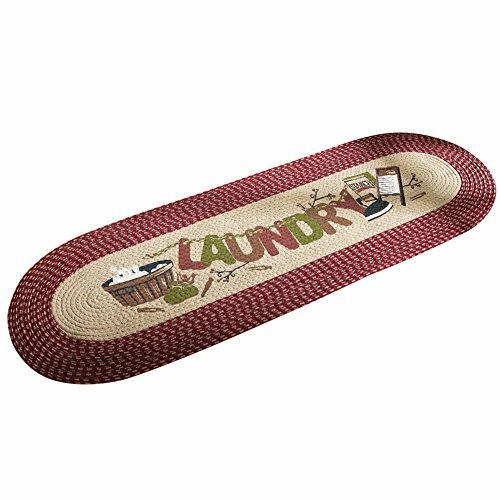 You’ll find it will save you time on your laundry day and keep all the dirty clothes neatly into sets that can go straight into the washer. An iron is also a necessity. But you may not be lucky enough to have space for an ironing board. Using a collapsible, foldable ironing board can help save space. 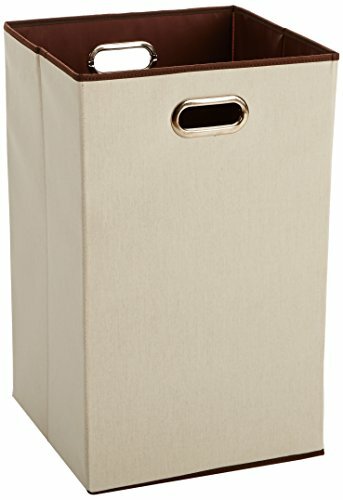 There are units available where the ironing board folds into a box or a drawer. Or consider a wall-mounted unit which will save you additional floor space. Also, remember that the ironing board could be used for folding clothes once they are washed and dried. Foldable table tops are available which can be used for your folding and ironing purposes. In which case, it will fold up against the wall when not in use. 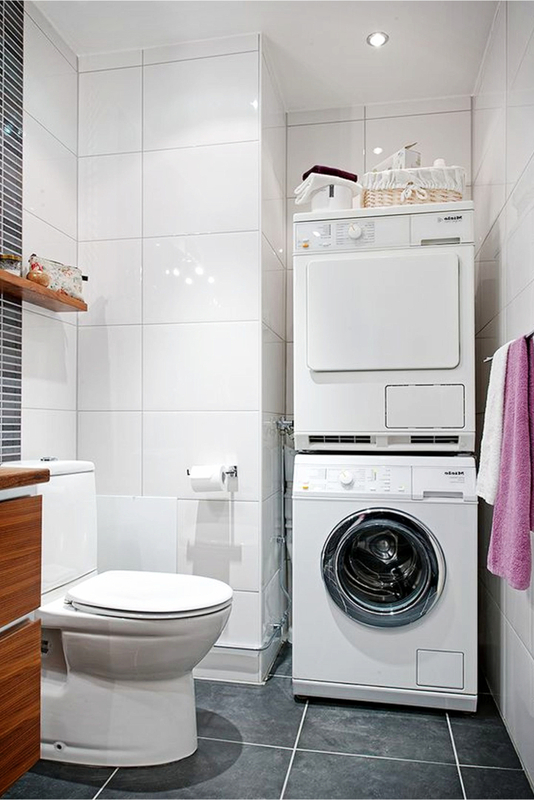 The space above the washer and dryer in your laundry nook can be used to access a rod that maintains hung-clothing once it comes out of the dryer. 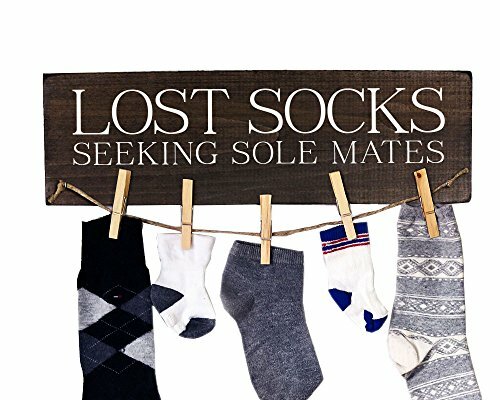 It will provide you with a simple yet effective way to keep your clothing wrinkle-free. It could also be useful for clothes that can’t go in the dryer and need to drip-dry. 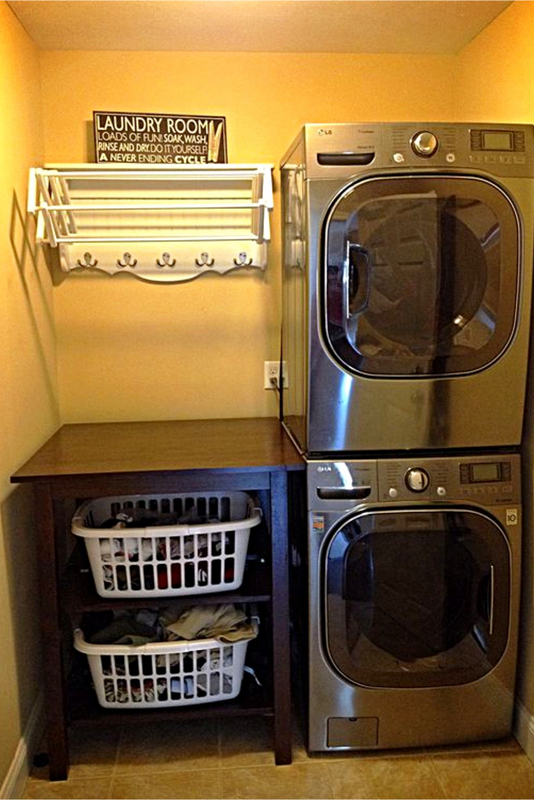 Or if you have enough space you could use a clothes rack by the dryer as an alternative. 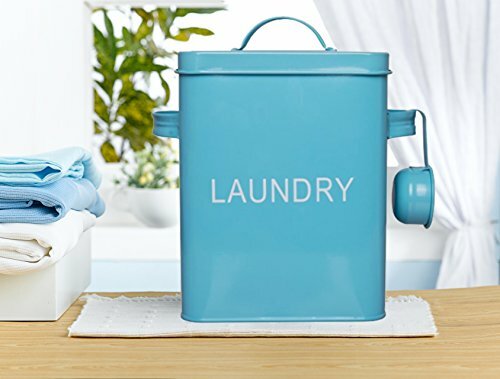 A small, compact dustbin near the dyer will be useful to collect the used dryer sheets and lint. A plastic container could be kept handy to store away any bills, coins, keys, paper and other items that get left behind in pockets. 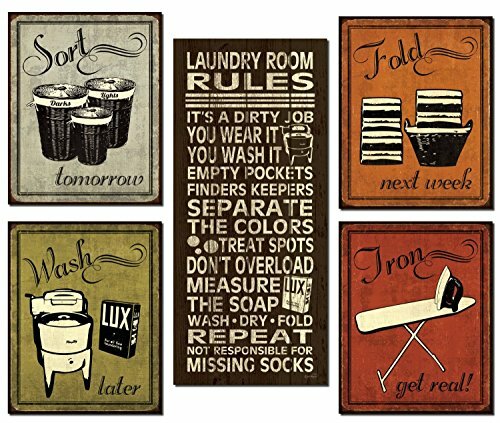 And last but not the least, remember to keep your floor clean and make sure you have enough light so your cute little laundry nook always looks warm and welcoming when you walk in.